Created by the Porsche Museum in Stuttgart, the comprehensive guide provides a wealth of detailed information and fascinating facts about the Porsche 911. From its iconic design to the technical concepts, everything is explained in clear, easy to follow step-by-step instructions to help you assemble this 1/4 scale model. Be sure to enter promo code FLAT10 during Checkout where it says, "Have a Promo Code? Apply it now." - Electronic sound module with genuine boxer engine sound. 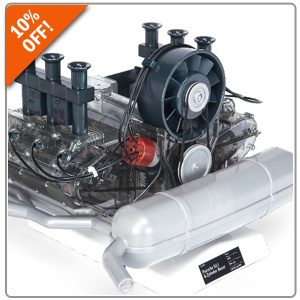 Click HERE for the Porsche Engine Scale Model!